Rather than shopping for baby clothes and diapers, Alyssa and Brian Tavormina went shopping for a burial plot for their unborn child. They purchased the blankets — soft, warm and protective as his mother’s womb — that Matthew would be wrapped in on the day of his burial. This grim scene was far from expected on the day the couple went in for a routine ultrasound in March 2017. What the doctor saw was devastating. A large pocket of fluid appeared to be coming off the back of baby Matthew’s head. Their doctor originally diagnosed Matthew with a cystic hygroma, a fluid-filled sac that results from a backup of lymphatic fluid and can be associated with several genetic disorders or be entirely coincidental. He sent Alyssa and Brian in for genetic testing after referring them to a high-risk OB-GYN. There was a chance, he said, that the cystic hygroma could resolve itself if the Tavorminas tested negatively for all associated genetic issues. Yet, before Brian and Alyssa received their genetic testing results, the high-risk OB told them it wasn’t a cystic hygroma at all. Instead, Matthew had an encephalocele, which occurs when the neural tube that typically closes during the third and fourth week of pregnancy to form the brain and spinal cord does not close completely, causing the brain and the membranes that cover it to protrude through an opening in the skull. This meant that no matter what the genetic testing said, Matthew’s condition would not improve on its own. This doctor told the terrified couple that their baby had a 0 percent chance of survival and that, best case scenario, Matthew would only be able to breathe and blink. These words would haunt them for the rest of Alyssa’s pregnancy. The Tavorminas later received their genetic testing results and discovered no abnormalities, but, to Alyssa, the time it took to receive those results was a blessing. During this time, the Tavorminas leaned into their faith to overcome their fear and pain, creating a Facebook prayer page for their unborn child. Over 500 people followed and offered prayers as the Tavorminas posted updates about their progress. This, to Alyssa, was both a beautiful and difficult process. When Alyssa was 16 weeks pregnant, she transferred her medical care to UF Health Shands Hospital, where physicians became concerned about something else. The physician noticed that besides the encephalocele, another pocket of fluid was present inside the back of Matthew’s head, and his cerebellum, the part of his brain that would coordinate and regulate muscular activity, wasn’t visible either. By the time Alyssa was 20 weeks, the doctor was even more concerned by the lack of visibility. Finally at 22 weeks, Alyssa underwent a fetal MRI and her physician gave the worried parents a definitive explanation for Matthew’s developmental problems. He explained that baby Matthew had a condition called Dandy-Walker, a rare congenital malformation involving both the cerebellum and the fourth ventricle. Typically, Matthew’s ventricles would be skinny, narrow pathways of cerebrospinal fluid located in the center of his brain. With a Dandy-Walker malformation, however, his fourth ventricle had ballooned up to be a fourth of his head size. Due to the malformation, Matthew’s cerebellum hadn’t developed properly and the pressure in his head caused by the oversized ventricle had created an opening in the back of his skull. The encephalocele pushing through that opening coupled with the Dandy-Walker malformation was an extremely rare occurrence. For that reason, physicians couldn’t give a positive prognosis for Matthew’s development, or any at all. Instead, the Tavorminas were met with bad news after bad news, and they had no idea what to expect when their baby was born. The couple was repeatedly given the same prognosis: Matthew could pass in the womb, pass at birth, be severely disabled or live a somewhat normal life. “We didn’t get a single piece of good news in every single ultrasound we had other than that he had a heartbeat, all four limbs, all other major organs and a precious face,” Alyssa said. Then, suddenly, nine months was almost up, and Matthew was preparing to enter the world via C-section. Due to Matthew’s condition, and the couple’s understanding that he would likely require neurosurgery within 24 hours of his birth, the parents hunted for a pediatric neurosurgeon worthy of the job. They found that physician in UF Health’s Lance Governale, M.D. When Alyssa called to ask a question about UF Health’s pediatric neurosurgery program, expecting a receptionist, the Harvard-trained chief of pediatric neurosurgery, Dr. Governale, answered the phone instead. With that, Alyssa was able to move forward and schedule the C-section at UF Health. Dr. Governale assured the Tavorminas that though they had heard many terrible prognoses for Matthew, it didn’t mean that any or all would come true. Matthew entered the world against the odds on Sept. 18, 2017. He emerged pink and crying, before being whisked off to the Neonatal Intensive Care Unit, or NICU, for treatment. The Tavorminas found out later that Matthew had his umbilical cord wrapped three times around his neck at birth, so it was another little miracle that he had needed to be born by C-section. Less than 24 hours after birth, baby Matthew was undergoing a more than two-hour brain surgery. Dr. Governale operated, removing the extra brain lining on the outside of the skull and tucking the rest of Matthew’s enlarged ventricle back inside. The hole in his skull would need to be monitored over time to ensure that it closed completely on its own, now that it was relieved of pressure. The afternoon after the surgery, Matthew drank milk for the first time and the Tavorminas were finally able to hold their baby boy. It was the culmination of a long and emotional journey for the couple, one that was eased by UF Health faculty and staff. 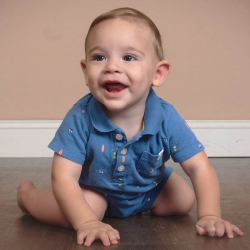 Before being released from the NICU a week after he entered the world, Dr. Governale informed the Tavorminas that their little miracle had hydrocephalus due to his condition. Matthew had a ventriculoperitoneal (VP) shunt placed at 7 days old to drain the excess cerebrospinal fluid from his brain. At 3 months old, Matthew’s VP shunt failed, which is common, and Dr. Governale replaced the shunt. Alyssa said Dr. Governale’s care for her son means the world. Today, Matthew is an active 1-and-1/2-year-old who loves to play with his older brother and has made tremendous gains, defying all the odds. Though he struggles with balance and coordination issues due to his malformed cerebellum, Matthew crawls quickly to make his way around. When he can’t balance sitting directly on his bottom, Matthew compensates for his physical limitations by sitting in the W-position. Recently, he’s begun pulling up on furniture to slowly cruise around the room while holding on. Matthew’s physical therapists say he will walk one day. Although the Tavorminas have now moved to the Jacksonville area, they continue to come to Gainesville for their pediatric neurosurgical care. And Dr. Governale is very happy with Matthew’s progress. Recently, Matthew’s neurologist told the Tavorminas that the baby was progressing so well that there was no reason for him to come back for a check-up unless new problems started to develop, such as seizures which Matthew is at high risk for due to the brain malformation. Dr. Governale is happy with his progress, too. Alyssa and Brian Tavormina feel blessed to be able to share their story of a miracle, and hope they can offer inspiration for families embarking on a similarly painful journey.